Fig. 8508-MO Three-Way Valves provide a convenient, economical means of diverting flow from one pipeline to another. They are often used in bypass arrangements in steam generating plants and process applications where they can save users thousands of dollars by eliminating conventional gate valves, bypass accessories and custom fabrications. Fig. 8508-MO Three-Way Valves are designed to handle high pressure applications such as boiler feedwater service in steam power plants. 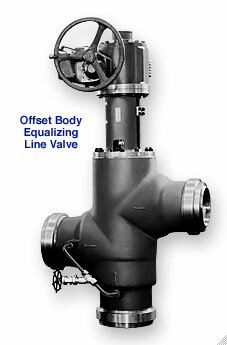 All valves can be serviced in the field without removing them from the pipeline. 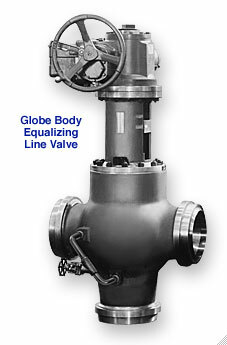 Replaces two gate valves, one tee fitting, and eliminates four welded connections. Used in high pressure feedwater heater bypass. 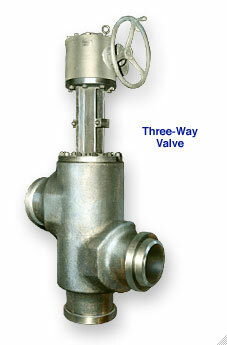 For more detailed information about Three-Way Valves, Bulletin 8B Literature. To submit a Request for Quote (RFQ) for Three-Way Valves submit an online interactive General RFQ Form.